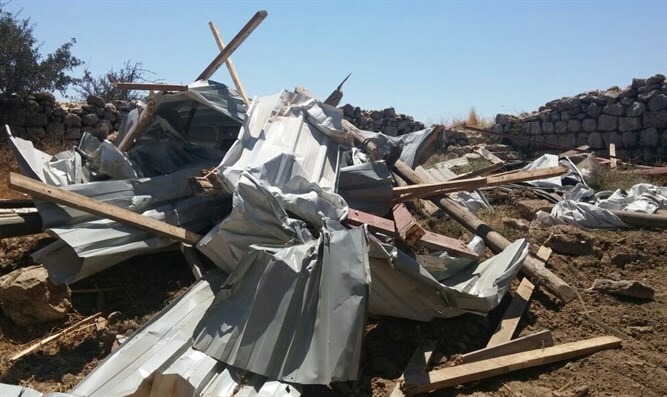 IDF demolishes structure built by former young residents of Amona in ruins of their home town. The IDF and the Border Police destroyed a building and confiscated equipment in the former town of Amona Monday morning. The structure which the IDF destroyed was built after the forced evacuation by the youth who lived there and wanted to return to their former homes. The youth erected a building, equipped the place with furniture and equipment, and prepared it for habitation. Some of the youth had even begun living there permanently. This morning, administrative and military forces accompanied by Border Police forces arrived - demolished the building and confiscated the equipment used by the youths to live there. Harel, who lived in Amona and was a partner in building the structure, said, "We were born here, we grew up here, and we will continue to return here." "After our expulsion we returned and built a building there. Today we [saw it] destroyed, but we are not discouraged. The group is determined and we will see results of our struggle."